ADDIS ABABA – The African Union headquarters, 24-storeys of clean lines and soaring glass, is Addis Ababa’s tallest building. It looks all wrong in the context of its dusty, low-rise surroundings (although increasingly less so, as the city develops furiously around it). It’s almost like it was accidentally transplanted from Shanghai or Beijing, which, in a way, it was – China paid for and built it. But there’s no question that it belongs. The building is Africa’s diplomatic centre, and Addis is the continent’s diplomatic capital. There’s nowhere else it could be. The city’s starring role in continental politics began in 1963, when Ethiopia brokered a truce between two rival African blocs with different ideas of what a continental body should look like. The breakthrough conference in 1963, where the Organisation of African Unity (OAU) was declared, took place in Addis Ababa, and it was only natural that the new institution should establish its headquarters there too. Not that there wasn’t a fight. Togo spent $120 million – that was half its annual budget at the time – on a lavish new hotel and conference centre in Lomé, complete with 52 presidential villas, in an effort to persuade the OAU to move its headquarters. The bid failed, and the complex turned into a ludicrously expensive white elephant, abandoned and left derelict for decades. Togo’s attempt to steal Addis Ababa’s thunder was only crazy because it failed. Had it worked, the investment would have looked like a small price to pay. As Ethiopia well knows, the benefits – both financial and political – far outweigh any costs associated with hosting the AU. Let’s start with the obvious. The AU rakes in hard currency for Ethiopia. There’s the $2,000-plus a month rentals for staff villas; the restaurants, hotels and conference venues built to cope with the regular influx of summit delegates; the thousands and thousands of flight bookings – often first or business class – which have helped Ethiopian Airlines become the largest airline in Africa. The AU is a cash cow, and Ethiopia has been milking it for more than 50 years. It’s not just about the AU itself. Almost every African country has an embassy in Addis, because they’ve all got ambassadors to the AU (Why else would the likes of beleaguered Mali, for example, maintain a mission here?). This applies to non-African countries too: Addis Ababa’s status as a diplomatic hub means it attracts more foreign representation than other African capitals of a similar size, including another vast international organisation: the United Nations Economic Commission for Africa. These missions all rent offices and houses, employ local staff, and shop in local stores, as do the research organisations and NGOs who trail in their wake. While there’s no doubt that the AU is good for the local economy, it’s also true that hosting the AU inflates Ethiopia’s influence over AU decisions. Unlike many African countries, Ethiopia is able to attend every meeting, and, as host, it is given the floor whenever it wishes. It is able to send high-level representation with ease, which can play a major factor in smaller meetings outside of summits. So far, so normal for any major diplomatic city, be it Brussels, Geneva or New York. But Ethiopia takes things even further, using its role as gatekeeper to the AU to protect itself from international scrutiny and criticism, and to monitor those who deal with the continental body. Non-governmental organisations are particularly affected. In order to open an AU liaison office in Addis, foreign NGOs must first be registered by the Ethiopian government. This registration can be withdrawn at any time, and with it, access to the AU. Several senior staff at international NGOs and civil society organisations told the Daily Maverick that this arrangement is premised on a tacit understanding: as long as you don’t criticise Ethiopia, your registration remains intact, and you are free to interact with the AU. On occasion, this includes hiring a local employee with known links to national intelligence. “We are very, very careful with what we say about Ethiopia. They are very sensitive, and the AU comes first for us,” said one senior NGO official, speaking on condition of anonymity – for obvious reasons. 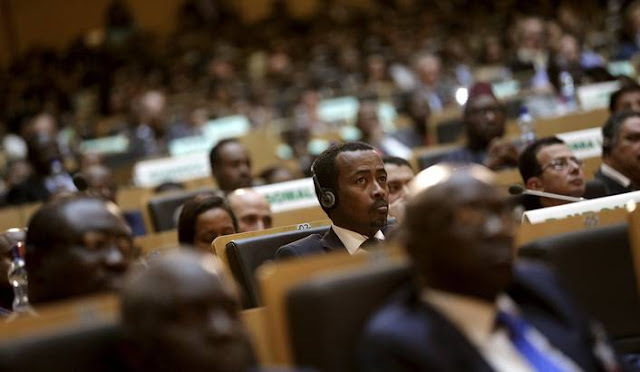 A similar arrangement applies to journalists, who cannot receive AU accreditation without first obtaining an Ethiopian press card; the arrangement is slightly different during AU summits, although visiting journalists must still register with the government communications office. Effectively, this means that Ethiopia, a country that is notorious for its tight grip on independent media, controls who can and cannot report on the AU. Again, this forces journalists to make a trade off: either report on the AU, and stay quiet on sensitive issues in Ethiopia, such as human rights violations; or report accurately on Ethiopia and risk deportation and losing access, perhaps permanently, to the AU. Several prominent NGOs and research organisations, such as Human Rights Watch and International Crisis Group, have declined to open an office in Addis for fear of working in such sensitive conditions, and base their offices that deal with the AU, elsewhere. Likewise, most foreign correspondents choose to work from Johannesburg or Nairobi rather than Addis, even though Addis – with all its diplomatic activity and excellent air links – is a natural base. This not only protects the Ethiopian government from criticism, but weakens scrutiny of the AU itself. The message is unmistakeable: we are watching you. An Ethiopian government spokesman did not respond to a request to comment for this story. The restrictions imposed on media and NGOs have the very real consequence of minimising negative news and information coming out of Ethiopia. This is one element of a censorship regime that is working. Recently, this was apparent in the coverage – or lack thereof – of the huge Oromo protests, where affected communities demonstrated against government plans to expand Addis Ababa. An estimated 140 people were killed, but the situation barely made international news, unlike, for example, the global headlines generated by the Marikana massacre in South Africa, even though the Marikana protest was smaller and far fewer people died. In some ways, the suppression of information about Ethiopia is a missed opportunity. The country is growing at a tremendous rate, and has made huge strides in the provision of healthcare and education. It desperately needs to improve its international image, which (unfairly) remains rooted in the famine reporting of the 1980s. There are good news stories that aren’t being told, as well as bad. Still, for an unabashedly authoritarian government, the ability to control information flow is the most significant advantage to hosting the headquarters of the AU. Just like that shiny AU building distracts the eye from the relative poverty of the suburb around it, so hosting the AU in Addis Ababa helps to disguise and obscure the darker elements of the Ethiopian growth story.